An iconic series of mid 20th century Swedish glass. 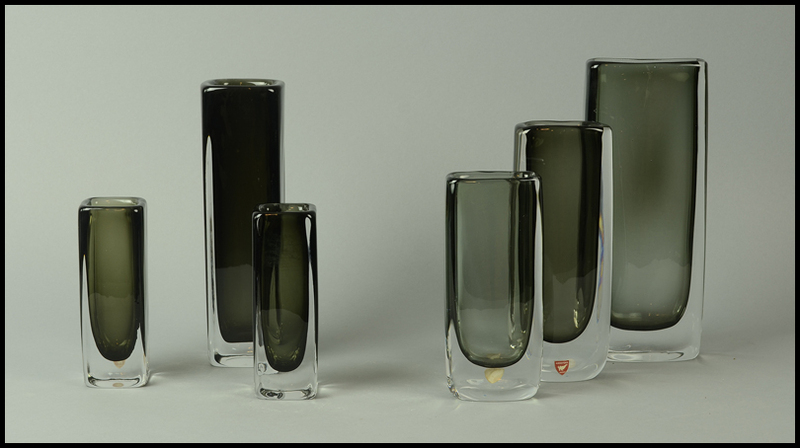 Nils Landberg (1907-91) designed his “Dusk” series in 1956 for the Orrefors glass company of Sweden. This series featured a smoky grey interior cased in an incredibly thick clear layer. Height 6″ (15cm) Width 2″ (5cm), Height 9 1/4″ (23.5cm) Width 3 1/4″ (8.5cm), Height 6″ (15cm) Width 2″ (5cm), Height 7″ (18 cm) Width 3″ (8cm), Height 8 1/4″ (21cm) Width 3 1/8″ (10cm), Height 10″ (25.5cm) Width 4″ (10cm).